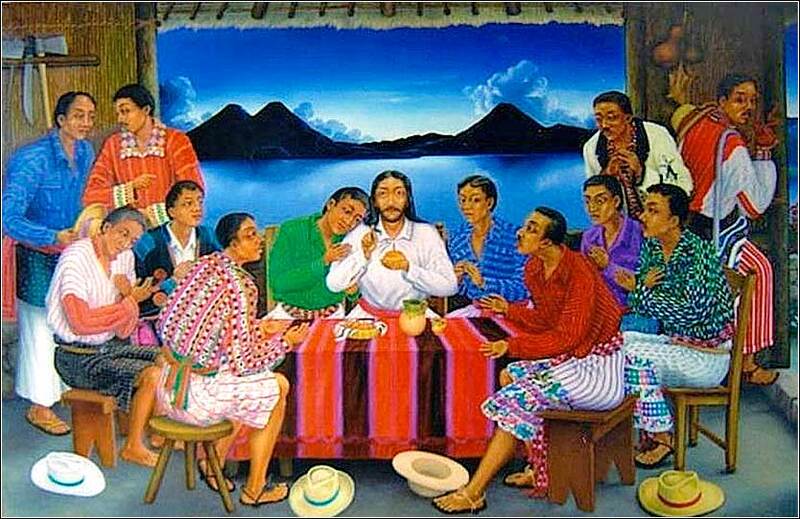 The Apostles of the Lake by Manuel Reanda, Atitlan, Guatemala, ca. 1998. O Lord, who has mercy upon all, take away from me my sins, and mercifully kindle in me the fire of your Holy Spirit. Take away from me the heart of stone, and give me a heart of flesh, a heart to love and adore you, a heart to delight in you, to follow and to enjoy you, for Christ's sake. from a prayer by Ambrose of Milan, 388 A.D. Enemies have driven me into Thy embrace more than friends have. Just as a hunted animal finds safer shelter than an unhunted animal does, so have I, persecuted by enemies, found the safest sanctuary, having ensconced myself beneath Thy tabernacle, where neither friends nor enemies can slay my soul. Truly, enemies have cut me loose from the world and have stretched out my hands to the hem of Thy garment. ah, so that I may for once be freed from self deception, which has entangled me in the dreadful web of illusory life. Therefore bless, O Lord, both my friends and my enemies. A slave curses enemies, for he does not understand. But a son blesses them, for he understands. For a son knows that his enemies cannot touch his life. Therefore he freely steps among them and prays to God for them. What are we to think when we look at Western society and the direction it is headed? It seems sometimes like God is losing the battle. Church attendance is down; in many places, beautiful old church buildings have become little more than local recreation centers and wedding chapels. Governments sometimes seem to be actively promoting atheism, especially in schools. Celebrities and the media seem to espouse ever-increasing degrees of sexual promiscuity in the name of personal freedom. And Christian churches themselves are hardly perfect. Catholic bishops being indicted for conspiracy to commit child molestation will hurt for many years, and every week seems to bring another pastor or minister who has robbed the church bank account. Not even to mention the issue of hypocrisy. As with so many problems, the solution to the pain, frustration, and helplessness we may feel about these issues is right in the Bible. Even before Christ, Isaiah prophesied that only a “remnant” of Israel — God's chosen nation — would be saved. Nothing in the Bible promises that we will live in a world that is good or just. We must do what the Bible commands us to do, and we must be at peace with the result, for God is in charge, not us. We must accept the possibility that God knows, or even intends, that during this age societies and governments will be dominated by atheism and sin. Nowhere are we promised that every person, or a majority of people, or even a large number of people, are going to know God's grace. Total victory will not be ours until Christ comes again, and only God knows when that will occur. Taking, as He did, this sinful world as it is, not as I would have it; Trusting that He will make all things right if I surrender to His Will; . . . 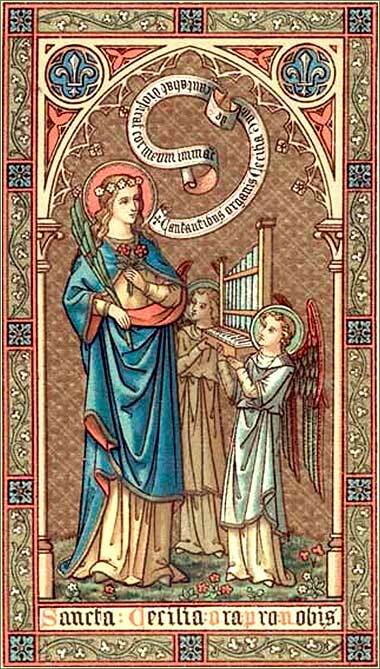 Antique Catholic prayer card to St. Cecelia. The scroll reads “Cantantibus organis Cecilia virgo decantabat dicens Fiat cor meum immaculatum” (see Page Two for more).